It was chaos in the Macavity children's room. Packing was hard, but not for Rumpus. He was done, he after all will only need his swimming trunks. Luckily his motherr caught him just in time! I have a hunch that Skimble is taking everything! I think you are right, but her mom will probably do her packing! 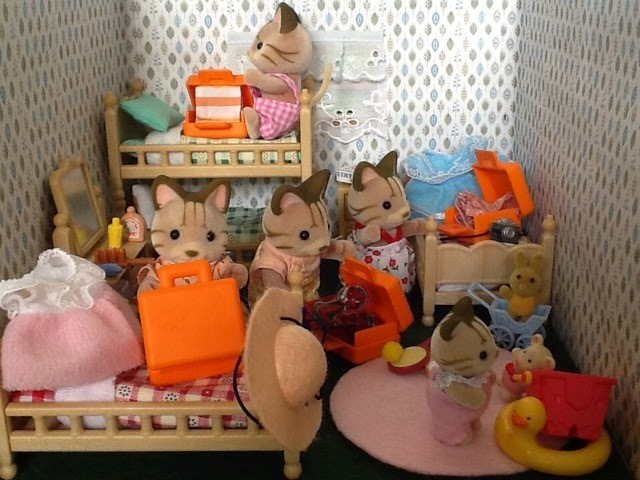 Wow, they all have matching orange suitcases :D Lovely scene! I hope Rumpus packed at least some toys too. The suitcases are from my boy's lego collection, I think it suits them perfectly!